It was a day of full of team work today at Earls Hall. Throughout the day a number of children represented the school at the Southend Boccia and New Aged Kurling tournament at Garons. In the morning our Boccia team played well, winning three games and losing three games which proved to be an exciting result for all involved. In the afternoon the New Aged Kurling team won six out of eight matches meaning that they were ranked third place overall. Well done to all of the children who took part, we are proud of you! Meanwhile, another team of children represented the school at the National Young Mathematician Awards. In the first round, nine teams entered in the Southend regionals and Earls Hall qualified for the second round which took place today. The children were set a number of high level Maths challenges and were marked on mathematical skills, teamwork and communication of their reasoning and solution. We will find out how the team scored next week, good luck! Well done to all of the children who represented the school, we are proud of you! Meanwhile, back at school, both Mr B and Mr Geach enjoyed lunch at the centre table with children who had been identified displaying excellent manners in the dining hall. Well done children, we are proud of you. In the afternoon Mr B was joined in his office by a group of children from Year Six who were chosen to write the official Christmas cards the school send out each year to friends and fellow schools in the area. Children from KS1 made penguin cards on Monday afternoon with Miss Bennett and today the inserts were written to the recipients in stunning handwriting. 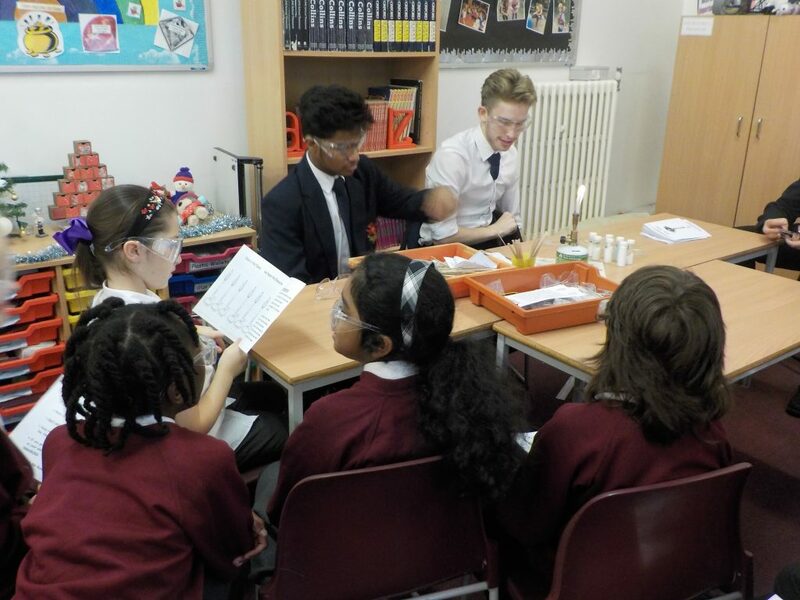 Upstairs some children who were identified as keen Scientists in Year Five were joined by twelve students from Westcliff High School for Boys who taught them how to conduct a series of experiments covering three aspects of Science; Chemistry, Biology and Physics. The children had the opportunity to burn elements over a bunsen burner and observed the colours. They looked at cells from their cheeks under a microscope, investigated Bernoulli’s principle of air pressure and made parallel and series circuits. It was a great afternoon, thank you to all of the students who gave us their time. ← Rockin Around the Christmas Tree!